The Walkers Haute Route trek from Chamonix, France to Zermatt, Switzerland is a classic Swiss trek that cuts through some of the most spectacular alpine terrain on the planet. High alpine passes, quaint Swiss villages and sweeping mountain vistas are all found on the Haute Route Trek. The Haute Route trek is a true European hiking adventure with lots of time spent in the high alps along the hikers Haute Route. Our adventurous style combines the experience of the rustic Swiss alpine huts with the comforts and luxury of 3 and 4-star inns. Since the alpine huts and the hotels provide our food and bedding, we hike the Haute Route each day with a lightweight day pack. While the Swiss hut system is dorm-style lodging, spending a few nights high in the Alps allows you to fully immerse yourself in the Swiss Alps experience. However, most nights are spent in comfortable hotels in quaint Swiss villages. On the nights that we spend in hotels in the villages, we provide a luggage transfer so you can have access to all your other clothes, etc. We get you high into the Swiss Alps with use of the high mountain huts, but also spend time in the quaint mountain villages with private rooms and showers. The best of both worlds! Our Haute Route Trek begins at the traditional starting point of the Haute Route in the French alpine village of Chamonix. We then quickly cross into French-speaking Switzerland. After hiking through the town of Verbier, we make our way high into the Swiss alps and begin using the high mountain hut system. We make our way across an easy glacier crossing and eventually end up in the small Swiss village of Arolla and then through high mountain passes into German-speaking Switzerland. The last leg takes us through more small villages and into the Visp Valley where we eventually arrive in the car free town of Zermatt under the shadow of the iconic Matterhorn. Almost all of the Haute Route hike is along alpine trails high up in Switzerland. Very little off-trail hiking is encountered, but we do make use of ladders occasionally and perhaps an easy glacier crossing. We consider our walkers Haute Route to be an adventurous on-trail Swiss hiking tour. We include all lodging, food and transport during the Haute Route trek and take care of all the logistics, allowing you to relax and enjoy the spectacular alpine surroundings. We keep our group sizes small, no more than 8 guests, for everyone's enjoyment. Hikers on the walkers Haute Route trek should be in good physical condition and have some previous hiking experience. The ability to hike up to 11 miles a day with a day pack is necessary. We provide private and occasional public ground transportation when needed on the Haute Route Trek including mountain lift fees. Lodging is in 3-4 star inns ands simple country inns at double occupancy (single occupancy upgrade available) with a few nights in high alpine huts in dorm style rooms. All meals are included such as continental breakfast, pack lunch and traditional Swiss meals. We meet in the alpine center of Chamonix for a dinner meeting to discuss the logistics of the trip. Hotel in Chamonix is included. Today we take the local train up the Chamonix Valley to the town of Le Tour where we board a gondola that takes us up high into the alps. From the top of the lift we begin our trek as we hike across the Col du Balme and quickly into Switzerland. We make our way to the Col du Forclaz where we spend the night in a small hotel. We trek from Trient along trails over the Fenetre d'Arpette and down the Val d'Arpette to the charming lakeside town of Champex where we spend the night in a comfortable hotel, just steps from the beautiful lake. Luggage will be waiting for us at the hotel. 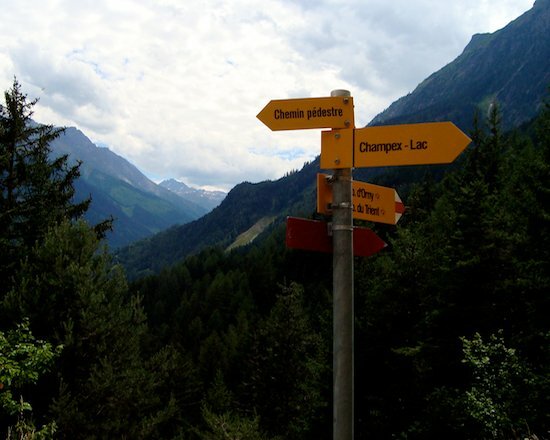 We spend the morning hiking downhill from Champex and then take a short train to the mountain resort town of Verbier. From Verbier, we hike to the charming high mountain hut of Mont Fort. We leave the Mont Fort Hut and the Verbier area and make our way to towards the Prafleuri Hut near the Grand Deserts Glacier. Today is a bigger day in which we cross three passes through stunning alpine scenery. Overnight at the Prafleuri Hut. Today we hike over the Col des Roux, along the Grande Dixence lake, climb ladders over the Pas de Chevre, and then descend to the charming Swiss village of Arolla, where we enjoy a charming hotel and more good swiss food. Overnight at a hotel in Arolla. Luggage will be waiting for us at the hotel. We climb up to the Moiry reservoir and on to the Moiry Hut in a stunning location surrounded by glaciers. One of the most scenic huts of the trip. Today is a leisurely day hiking down to the village of Zinal where we will spend the night in a hotel. Luggage will be waiting for us at the hotel. We leave the Zinal and hike over the Meidenpass depending on group strength and goals. The views of the Surrounding alpine peaks (inlcuding the Matterhorn) are spectacular. We stay in a small hotel in the small hamlet of Gruben. The final day of the Haute Route takes us from Gruben over the final col of the trek, the Augsbordpass, and down to the tiny hamlet of Jungu. An exciting cable car ride from Jungu takes us down to St. Niklaus where we board the cog-wheel train to famous Swiss resort town of Zermatt under the shadow of the Matterhorn. If energy allows, we may get off the train early and walk the final couple miles into Zermatt. We will stay in a 3-star hotel (Luggage will be waiting for us at the hotel).